PDFs provide a convenient way for sharing and sending documents to colleagues and customers. Yet when one scans a document directly to PDF, or scans and then converts it to PDF, the document will be transferred as a large image file, which makes pdf text not searchable, nor selectable — unless you convert the PDF files using a PDF OCR software. This article will share basic things you need to know about ocr on mac, together with 3 solutions (total 6 methods) to do pdf ocr on mac. Things You Need to Know about OCR Mac? What Does OCR Stand For? OCR (Optical Character Recognition), it is the mechanical or electronic translation of scanned images of handwritten, typewritten or printed text into machine-encoded text. It is widely used to convert books and documents into electronic files, to computerize a record-keeping system in an office, or to publish the text on a website.Without OCR, or to be specific, without Mac OCR software, the scanned PDF cannot be recognized by comuper, hence not allow you to edit or search. Though there are some free tools coming with MacOS for users to deal with PDF files, like Preview and Automator, mac ocr service is not availble. Preview can help view and manage and edit PDF files on mac, but the editing feature is only limited to native PDFs. Though you can surely open scanned pdf in Preview, it is displayed as image files, no changes can be done to the file, including but not limited to copy text, search text, annotate, highlight, etc. Many mac users may use Automator to extract text from PDF, but still, this can only be workable for native PDF. You just get blank text file when trying to extracting text from scanned pdf using Automator. Some mac users may have installed Adobe Reader on their mac to view and manipulate PDFs since it is free and easy to view PDFs. However, it Adobe Reader cannot work to do OCR on mac, unless you update to or subscribe its Adobe Acrobat for mac. As we can see, there is no free ocr solutions on mac at all, we will have to resort to a pdf ocr software. OCR is rarely accurate or affordable, but we have choice. Here, basing on affordability, simplicity and OCR performance, we recommend PDF Converter OCR. It is an OCR program designed to do virtually all kinds of document conversion with high quality results. Recognize 200+ languages, including Spanish, Chinese, Japanese, etc. As Cisdem's mac ocr tool offers free trial with full features, here we will take Cisdem PDF Converter OCR, the most affordable and efficient way as a demonstration to OCR a PDF on mac. Launch Cisdem PDF OCR Program for Mac. Download Cisdem PDF Converter OCR and then install it on Mac. Run it to start ocr a pdf on mac. 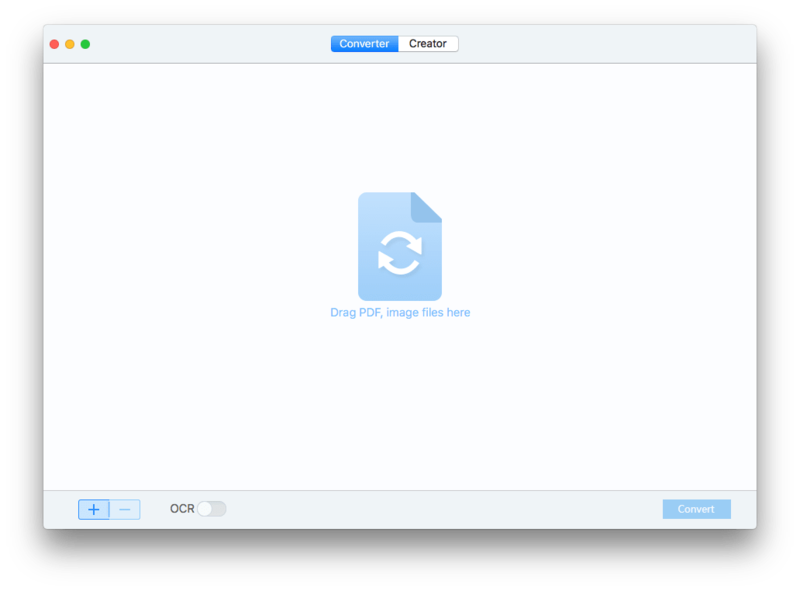 Add PDF or Image Files for OCR on Mac. Go to the interface of "Converter", import PDF or images into the program by drag and drop PDF files, or click the "+" button. It supports batch ocr pdf on mac, you can add dozens of files at one time. Turn the OCR button ON, select language and page range. It can recognize 200+ languages and supports batch or partial conversion. Also, choose output as needed before starting OCR PDF on mac. Click "Convert" to perform OCR on PDF files. The OCR process will finish within seconds, you can find the converted file in output folder. The PDF OCR is done! Also, you can watch the tutorial video to do mac ocr now. Adobe Acrobat, since its creation, is always considered as the most powerful program to deal with PDFs, and its prominence apparently continues in PDF ocr. Besides, it is cross-platform allowing different users to benefit from this feature. Speaking of its PDF OCR, Adobe Acrobat can automatically perform OCR on scanned files when exporting to an editable formats, but it also offers a set of tools to enhance the OCR performance, for example, capturing the file with mac camera to do ocr, choose pages to perform partial pdf ocr, copying recognized text with formatting, editing the PDF file after ocr directly. Undoubtedly, Adobe’s editing feature is the key persuading users into such a purchase. As we know, OCR is rarely perfect, even if there appears OCR errors, users can directly edit or rectify within Adobe, that’s quite convenient. Open PDF with Adobe Acrobat. Go to Tools> Enhance Scans, select "Enhance", you can choose to OCR all pages or current page, then all the PDF text is searchable and selectable, also you can right click on the text to choose "Edit Text" within the program. Finally, save the PDF file or go to Tools> Export as Word or other formats. ABBYY FineReader OCR Pro is a dedicated OCR software on Mac for converting scans, PDFs and digital photographs into searchable and editable documents. The OCR process is automated, you only need to tell ABBYY FineReader Pro which document to load and to where the OCR version should be saved. The functionality of scanning papers as digital copy and then importing into ABBYY FineReader is quite pleasing, it allows users to convert paper files to editable PDF or other format easily and effortlessly. In addition, a series of tools are built in to customize or enhance OCR, such as tweaking paper scanning process, editing image, adjusting image quality, adding new task or pages for OCR, etc. Yet, ABBYY FineReader is just a powerful OCR tool, it doesn’t allow editing, and basing on this, its price seems too high. Go to Export, save as searchable PDF or other formats. For sure, there are a lot of new contenders in this field of PDF OCR, but these 2 OCR programs are always the top choice to consider for our mainstream users. It is quite understandable that the high price put off some users, in light of that some good OCR program can do the job as good as them without costing so high. Search Google, we can find there are several websites that can OCR a PDF on mac for free. Such OCR software can be used online and usually convert on page at a time. However, many of them cannot handle images of poor quality. So people have to ensure they have high quality images when using these online PDF OCR tools, otherwise accuracy will be adversely impacted. Here are the two online options for you to OCR a PDF, which give good results than the other online sites in our test. onlineocr.net allows you to convert scanned PDF and images (jpg, bmp) into editable Word, Text, Excel, output formats. And the generated documents keep the layout and images of the original file. Moreover, this free Online OCR service supports 46 recognition languages. To use this tool your files must not exceed 5mb. Free online OCR is another free web-based OCR service to OCR PDF. It can extract text from PDF, GIF, BMP, JPEG, TIFF or PNG files. To get started, just add an image file and select an output format from DOC, PDF, TXT or RTF, and click "convert". Click "Convert" to do OCR on PDF. Though most of us tend to prefer a professional Mac OCR program, there are still some users looking for Mac OCR open source, especially those tech-savvy or coding-savvy users who think mac ocr open source brings better OCR results. Tesseract is an open source OCR engine started in 1980s, and later sponsored by Google since 2006. Now, it has become one of the most accurate ocr open source and widely applied to optimize Google services. Users can find the source on GitHub, a great platform allowing software builders to communicate and collaborate. Cuneiform is an open source text recognition program working on printed files. It does a prominent job to recognize scanned files and supports batch OCR, but relatively poor on highly maintain table structure. Though the open source is not frequently updated, even there is no any update for, years the Cuneiform team still work on this and users can expect to get something more. Mac OCR open source is not for everyone. Most of our users are not computer professionals, either want to get the OCR work done by doing everything ourselves. Mac OCR open source is, obviously, not the only way we get accurate OCR results. Professionals, such as Cisdem, Adobe, they are taking accurate OCR job to us, also, they does this for us. Mac OCR open source doesn’t give extended features, you may only allowed to make the files in text, but not to editable and well-formatted Word, Excel, Keynote, etc. So, which one will you choose to do ocr on your mac and make your scanned files editable for futher use? There may be more choices out there, but the one well balancing funtionality, OCR performance and simplicity, in my opinion, is Cisdem PDF Converter OCR. For users who want to keep their paper work simply but efficient, it is worth a try. Convert native PDFs to other formats and create PDFs quickly. Reduce the size of single or multiple PDF files on Mac. Sometimes we need the text content on screenshots. Instead of typing word by word, we can actually extract text and tables easily with the help of OCR software. Here you will learn the easies way to OCR screenshots on Mac and export them as text, Word or Excel. With a growing demand of recognizing text or content from scanned files & image captures, OCR tools get popular. Cisdem is the one stands out from dozens of OCR tool designers, for its high OCR quality and creative features. How to Convert Keynote to PDF on Mac, Windows or iPad? Some people use Mac in their work and life, but others use windows. Windows users can’t directly open Keynote file, but PDF files can be spread well between Mac and windows. So for windows users can open keynote files, we usually need to convert Keynote to PDF. Online tool is not doing good, so many missed data and gaps, also you need to manually adjust the formatting quite a lot. My question is: Can Cisdem PDF Converter (for Mac) convert forms containing words, pictures and different styles into writable and editable Office Word, Excel and Power Point? Please elaborate. Thank. What about using OCR to change a scanned document into one that can be edited?